Rooms from $68.99 per night. Description This Snellville, Georgia hotel has free internet access and non-smoking guest rooms. Apartment-like accommodations with kitchens and data ports help the Crestwood Suites of Snellville appeal to our's extended-stay guests. The Crestwood Suites hosts 130 apartment-like accommodations each featuring a small kitchen (two-burner stove microwave refrigerator and coffeemaker). 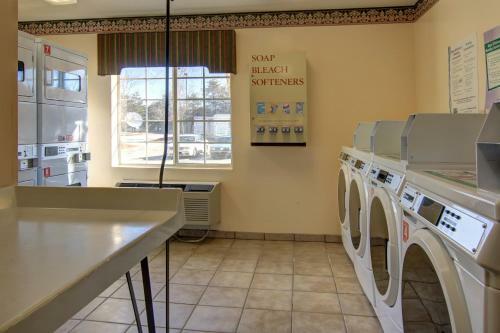 Other in-unit amenities include cable TV internet availability data ports hairdryers irons and ironing boards. Guests are offered access to a nearby fitness center and fax and copy services are available via the hotel's 24-hour front desk. Parking is free including ample space for larger vehicles. The Crestwood Suites of Snellville is located across the street from Emory Eastside Medical Center. It's within walking distance of several restaurants shops and a movie theater. Stone Mountain Park is 10 miles away. Atlanta's Hartsfield-Jackson International Airport is 40 miles from the property. Add Intown Suites Snellville to your free online travel itinerary.